Many homes have staircases that arent bordered by a wall. 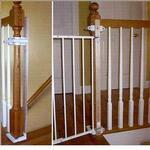 In this case the Y spindle aids installation of the pressure mounted gates to these types of staircases. 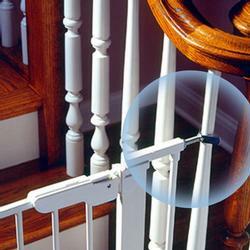 The Y spindle wraps around the baluster to provide a secure installation. On the Gateway® (G-11, G-14), use Y spindles only on the hinge side of the gate. No more than 2 per gate can be used. On the Center Gateway® models (G-15, G-35), the Y spindle can be used on either side of the gate. However, they must be used on the same side. No more than 2 per gate can be used. NOTE: For installation of a pressure-mounted gate on a staircase with ballusters on both sides, you will need to use a K10 Installation Kit.